The sweltering heatwave we’ve endured/enjoyed in the UK recently has meant needing to keep cool without losing my cool and by cool, I mean style of course. And the need to show the world my character and mood through my clothes (ideally without resorting to denim shorts, tees and flip flops on repeat)… I won’t give up my frocks without a fight guys, and thanks to Laura Ashley I don’t have to. They’ve got me covered this summer (literally). I adore Laura Ashley’s effortlessly chic day dresses which are a combination of three vital ingredients I look for when it comes to key pieces: they’re elegant, comfortable and crucially, true to size. All the dresses here are a UK size 10 so I didn’t need to go up or down a size as with so many other high street stores. Yaaas to consistency, and also being able to order online with confidence! 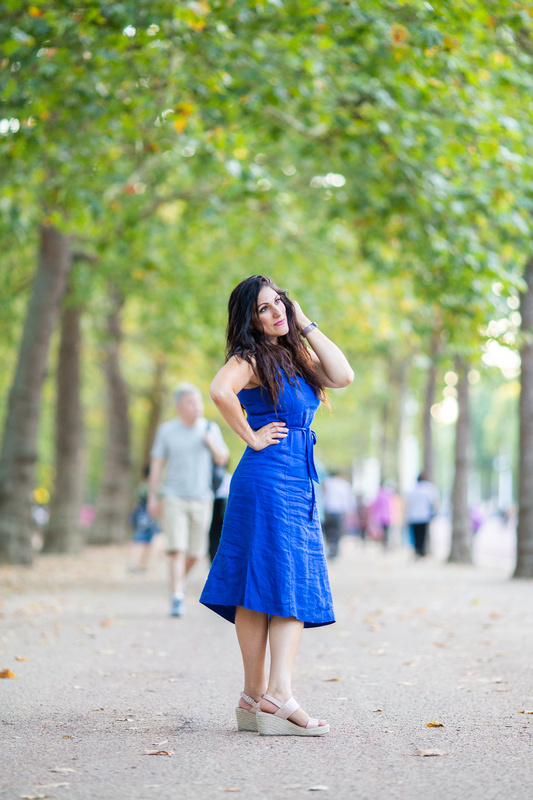 Here are the summer dresses I’m loving right now. First-up we have this sleeveless floral shirt dress of dreams which tapers in at the waist and comes out a little at the legs making it one heck of a flattering frock on my hourglass figure. This is a shirt dress like no other too, as the buttons don’t pop over the chest (I’m a 32D) and this dress has pockets, which will always get my seal of approval as a mum of two (the pockets in my dress currently home to two large LEGO pieces and half a flapjack). Handy! 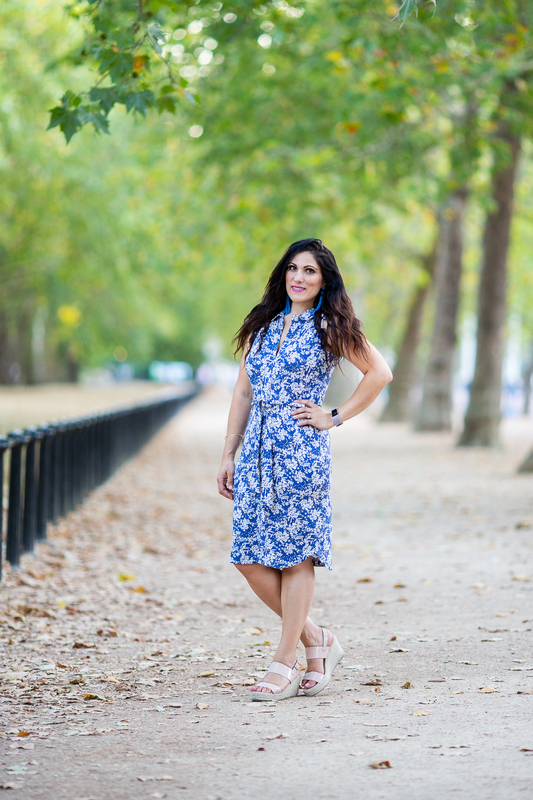 This dress proved the perfect choice for a picnic in St James Park and would equally work dressed up for a wedding or plush summer party and it might just be my favourite floral frock of all time (and if you follow my blog, you’ll know that’s quite the testimony). Second-up, another shirt dress in my most favourite hue: cobalt blue, and sleeveless again (do wear these with cardis come autumn/winter) and a denim jacket in the evening. This linen number makes quite the style statement and gave me an added boost of confidence when I wore it on the red carpet at a Disney premiere recently, where I posed for the press. This dress can be as formal or as informal as you like. Pop on some Converse for a trip to the playground or add heels and statement jewellery for a night out with the girls. I love how hard Laura Ashley dresses work for you: they’re utterly versatile and beautifully made. The brand really know what women want: flattering cuts, bold prints, and comfort too. Speaking of comfort, hello the dream mumboss dress right here, with a frock which took me from soft play to the park, and right back to my desk in one (busy) day. Stretchy, striped (which are mis-sold as unflattering by the way, as they’re really not), this dress will even work over jeans come colder weather and I’ll be living in it on the school-run to boot. Go bare legged with bright white trainers or add tights and over the knee boots for winter, and embrace those beautiful Breton stripes. Oh you are lush Laura Ashley. 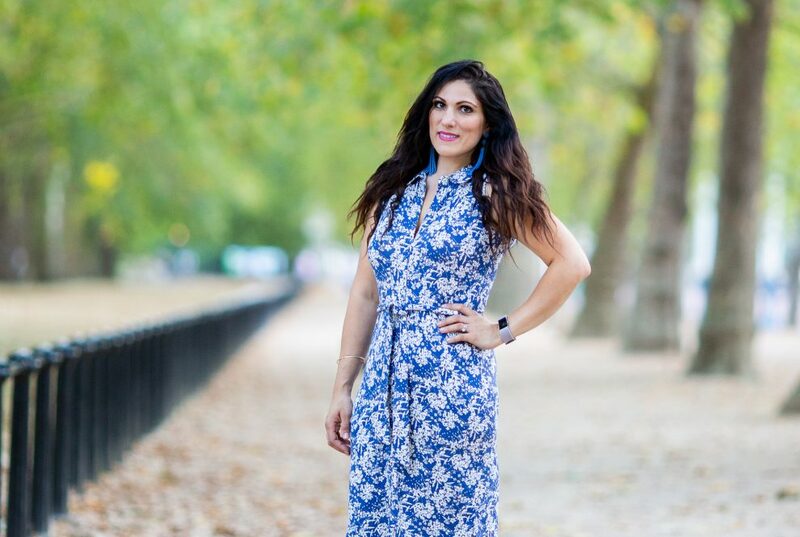 Vicki is the founder of multi-award winning blog Honestmum.com and is the bestselling author of Mumboss. Vicki was styled by Lauren Jobling and photographed on location in London and Windsor. Follow Vicki @honestmum. Shirt dresses are LIFE. I love how beautiful and versatile these dresses are—not to mention practical: who DOESN’T need a pocket for stowing such flotsam as Legos and pancake fragments? !